« Paul Page – Welcome Home! 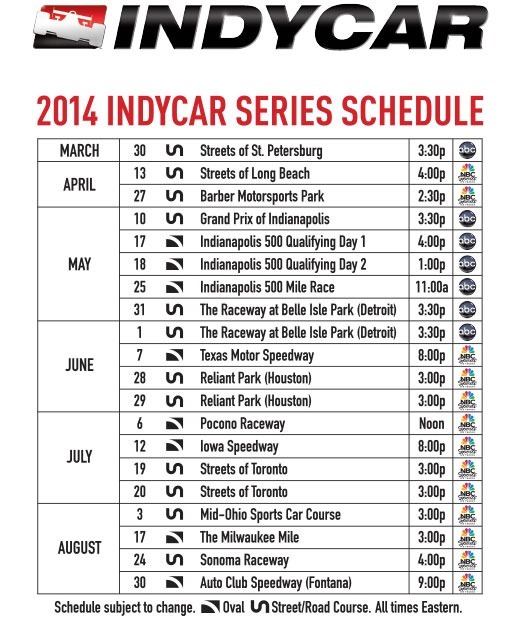 The television schedule for the 2014 IndyCar season was released last week. As usual, it was a mixed bag. There were a couple of pleasant surprises, as well as a few head-scratchers; but the majority of it was mostly expected. First, the positives – the race at Barber Motorsports Park had been reported as being on a Saturday next season. The Barber website said it was Sunday, but the IndyCar website said Saturday. I don’t know if it was a typo, or if there was some initial confusion or if the race had originally been slated for Saturday. Whatever the case, it’s now showing up everywhere as a Sunday race. Selfishly, I much prefer the Sunday date. Barber is one of the few races I go to each year. We make a three-day weekend out of it. I was not pleased that our three-day weekend had been trimmed to two. Now, it has been confirmed as being a three-day weekend with the race being run on Sunday as it always is. Another pleasant surprise also involves Barber, as well as Long Beach. It had been reported earlier that ABC/ESPN would carry the first six races of the season before handing the baton to NBCSN for the remainder of the season. While ABC will carry the opener at St. Petersburg, NBCSN will carry Long Beach and Barber. I know many see that as a negative, having two spring races on an obscure cable channel, instead of network television – but I don’t see it that way. The hard-core fans seem to enjoy the NBCSN broadcasts over that of ABC, which has a habit of describing a race as if the viewer has never seen one before. That statement is not entirely fair, because we know there will be changes to the ABC booth next season. We just don’t know who will replace Marty Reid or if there are any other changes coming. But based on recent years, it’s safe to say that the ABC booth has mostly been an exercise in IndyCar Racing 101. ABC comes back for the entire month of May, which will consist of three races as well as qualifying weekend for the Indianapolis 500. The ABC return kicks off with the Grand Prix of Indianapolis, which will be a Saturday race on May 10th at 3:30 EDT. The road course debut at Indianapolis will be followed by the first real negative surprise of last week’s announcement. We already know that qualifying for the Indianapolis 500 will have a different look in 2014. It just hasn’t been confirmed how different it will be, One thing we now know is that the TV coverage will have a different look, as well. For the past few years, we have been spoiled by wall-to-wall coverage of qualifying on Versus/NBCSN. Even though I was always present on the grounds of IMS, I would always set the DVR and watch the coverage throughout the following week before the race. To me, it was the most enjoyable coverage of the entire season. The broadcast had a laid-back feel to it. If there was no on-track activity, they always seemed to have interesting stories to tell and interviews to share. I know I’m a hopeless junkie, but I still have this past qualifying weekend on the DVR and will go back and watch parts of it periodically, just to give me my offseason racing fix. It helps throughout the cold offseason. For 2014, ABC takes over coverage and will not come close to the six hours a day that NBCSN gave us. On Saturday, ABC will cover only the last two hours of qualifying, going from 4-6. The next day, ABC will be on the air from 1-3. I’m not sure if qualifying is over by then with the revamped format or what, but regardless – four hours over both days is all we’re getting from ABC for qualifying. Of course, ABC will handle Race Day duties as they have for almost fifty years. The month of May officially closes out on Saturday May 31st, when ABC covers the first race of the double-header at Belle Isle in Detroit. They will obviously be there the next day for Race Two also, but by then, the calendar will have officially crossed over into June. That race will conclude the ABC/ESPN portion of the schedule. The next week at Texas sees NBCSN take over for the remainder of the year. Just watch – the Texas race will be unforgettable, now that it is back on cable. ABC gave Texas a Saturday night prime time network slot, and it was a dud. It may have been the dullest race of the season. I can’t blame ABC/ESPN for not trying that again. The remainder of the schedule offered few surprises, but I can still find a couple of things to gripe about. For instance, the Pocono race starts at noon EDT. That means 11:00 am if you live in Nashville or Chicago. Worse than that – it means 9:00 am, if you happen to live on the west coast. Maybe Californians are used to it, but I’m not sure a lot of people will be tuning in to NBCSN at 9:00 am if they happen to live in the Pacific time zone. I realize it’s a 500-miler but it seems a later starting time could have been found. My biggest gripe is the opposite situation – coverage for the season finale at Fontana does not start until 9:00 pm EDT (6:00 pm PDT). Even those of us who live In the central time zone will have to stay up until midnight to see the champion crowned. Those on Indianapolis time will wait until 1:00 am to see the conclusion. That just can’t be good for ratings. I don’t know if NBCSN wanted the race to start that late, or if the track or the series requested that due to the almost certain intense heat that will come with running that race on the last day in August. As I said, overall there were no huge surprises other than qualifying weekend at Indianapolis. Everything else is minor, either way. But the fact that qualifying coverage has been cut by two-thirds does not set well with me. I guess I’ll just have to pay more attention to everything while I’m there, since there will be no full re-caps once I get home. But compared to what we had in the sixties when I was growing up and the sport was much bigger – this type of coverage is great. It’s a clear example of how spoiled we fans have become over the years. This entry was posted on December 9, 2013 at 4:04 am and is filed under IndyCar. You can follow any responses to this entry through the RSS 2.0 feed. You can leave a response, or trackback from your own site. My guess is that whatever the qualifying format for Indy, I’ll be spending a lot of time listening to the audio stream of the IMS radio network or 1070 the fan. TV windows of 2 hours do not leave much room for weather contingencies, and we ALL know how frequently THAT can occur. George, I know you know the Indianapolis 500 starts at Noon Eastern, how is that different than Pocono? I mean, I know it’s not the Indianapolis 500, but it’s still an important 500 mile race, I don’t see the difference. And just wait’ll you see or hear about how badly Miles & Co. are gonna screw up Quals at Indy! It’s so depressing…. On the late Fontana start, I think that has to do with the angle of the sun, not wanting it in the driver’s eyes when they’re going 215 or so, kinda makes for a dangerous situation. I always DVR the races, so I can start watching an hour or so after they start, and fast forward through all the commercials. Actually, I do that with EVERY show I watch. I look at this schedule and the first thing that strikes me is all the bitching that will happen from the purists because of the lack of ovals. I am miffed as well as to why, with all the concern about the Month of May desperately in need of Botox and on life support, that so little coverage will be given to qualifying. Can someone please explain the logic behind this? Personally I find the 2014 schedule, although compact- too short. The end of August to me does not signal the end of racing season. it’s a disappointment to see no races in September. I think the lack of televised ovals on ABC is pathetic. As for the limited coverage of qualifying for the biggest race of the year, there is no explanation. The television schedule is blatantly Indy-centric. Or rather, it is undoubtedly set up to maximize ratings for the 500. ABC has 7 broadcasts from only 3 venues, a majority of their broadcasts will be from IMS! I suppose the reasoning is that as Indy rises, so does the series. Certainly the philosophy in years past of using the 500 broadcast to build momentum for a summer slate of ABC races has not been tremendously effective, so there is little reason to scoff at this new direction. Still, it causes me to wonder whether Mark Miles is as interested in the health of the whole Indycar series as he seems to be about the health of IMS alone. On a couple of other notes, I would certainly hope ESPN or IMS will offer live streaming of the parts of Indy qualifying that will not be shown on ABC. Being able to follow all of 500 qualifying is a longstanding tradition for enough people to justify it, I would think. I also wonder what, if anything, this means for Indycar’s relationship with NBC. Taking 500 qualifying from them, one of their more popular broadcasts, had to have been a bit of a blow. Frankly, I was quite surprised to hear on Trackside that NBCSN is still planning on broadcasting Carb Day. I’m guessing they are under contract to do so, but bringing an entire broadcasting staff in just for Carb Day is probably not something NBC is excited about. NBCSP is so far and above ABC’s lame coverage of IndyCar racing maybe NBCSP could put in some extra effort to their already excellent coverage and flat out embarrass ABC or at least offer what Always Bad Coverage looks like up against another network that takes it seriously like NBCSP. If young promising drivers were not so enticed by the $ and opportunity component in NASCAR and encouraged to go OW and actually have a decent feeder system instead of a 10 year old, fledging Indy Lights program it would be better. feeder system is improving already. can’t blame drivers for following the money. I just hope Indycar can keep marketable and talented drivers like Simona and find a place for great young drivers who do want to stay open-wheel like C. Daly. I agree with you. The opportunities are limited for sure. I just can’t see Simona making it in F1 but I’m sure she is exploring everything she can. I hope Daly finds something in IndyCar. When I lived out in Phoenix, I loved how CFB, NFL, and anything else started as early as 9AM. It sure beats waiting around all day for event to start. To be honest, I was shocked and surprised to see ABC spend 2 hrs / day on Qualifying. Can’t remember the last time Indy qualifying was covered on network TV. Let’s hope the build up to the 500 results in improved ratings. Because if this doesn’t work it won’t be long before they pull the plug. ABC aired part of qualifying in 2008, the last season prior to the Versus deal. I think it was 2 or 3 hours on pole day. Much of the rest of qualifying (four days worth back then) was covered on ESPN and ESPN2. I recall a similar television schedule throughout much of the 2000s. The complaints about starting times, such as George’s complaints about Pocono and Fontana, are generally in the context of what is good for TV viewers. It is a real source of irritation to me that the people who actually spend the time and money to attend a race are often screwed over in favor of TV watchers. Most of the race times this coming season are too late in my opinion. Fontana is an exception for good reason. IMHO I believe most people who attend races would prefer earlier starting times such as noon. I would say that the so-called “hardship” of having to stay up to midnight to watch a race on TV pales in comparison to the hardship of getting home very late from a race due to a race starting late in the day. I agree that IndyCar need to offer more live streaming. Live streaming of the 500 qualifications would be welcomed. I am disappointed again in the lack of network coverage as opposed to cable. The cable industry is losing viewers in droves and has been for years. They lost over 100,000 subscribers in the last quarter alone and have lost over 5 million subscribers since 2010. Where are all these people going? Broadband internet. What does IndyCar offer live on the internet. Zip. I can’t imagine that there will be any improvement in ratings on an obscure cable channel regardless of what the on track product is. I don’t think TV puts people in the seats at a race. I think it is the opposite and for a large geographic segment of the country there is no race to take your children to. Once again as a cable cord cutter I am out as a viewer after June 1st. I really wish I could purchase a streaming subscription through Indycar or NBCSports. I too think it is a shame to lose the amount of coverage for qualifying at Indy. ESPN or ESPN 2 might be a solution. Am also very surprised that NBCSN will be doing Carb Day. I watched almost every moment of the 500 coverage this year except for the horse racing in the middle of the fast 5. I don’t know why ESPN doesn’t stream qualifying for all of the ABC races. As one of the West Coast representatives let me say that I have been dealing with 4:00 a.m. starts with F1 for years. The DV-R is a great tool, especially if you add time to each showing in case of rain or other delays. So, the early starts or late finishes won’t be a problem. BTW Fontana was disgustingly bright and hot in 2012, so the later start this year was helpful to both drivers and spectators. Let’s just see what works.